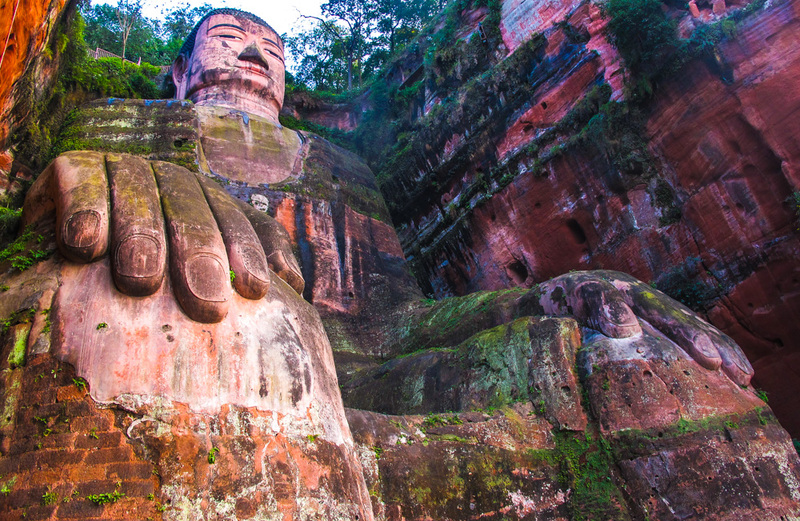 Giant Buddha statue in Leshan, China. As always proposed by MyRokan the places of interests to be visited are locations that provide values such as educational, motivation, cultures, and histories and so on. Although today we are making better progress in technology than people before us, but their determination to do something give us something to think about. That is why the remains of these monuments, still admired us to this day. 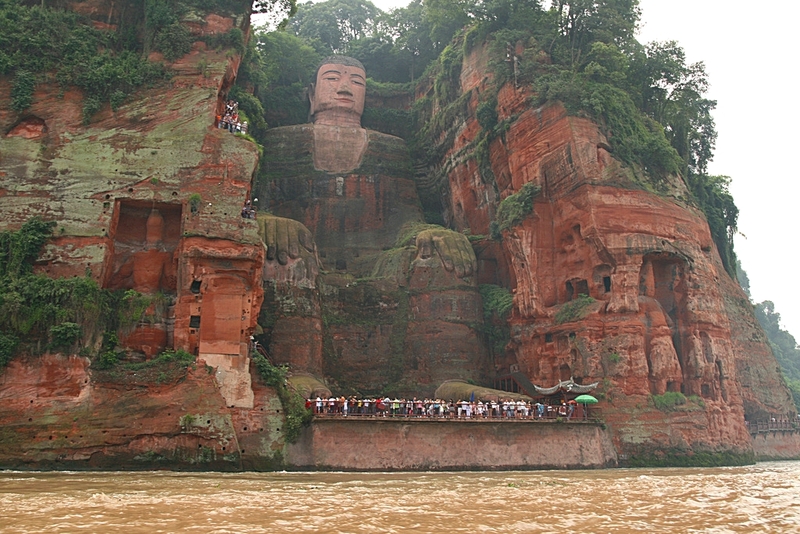 This time we will see another exciting remnant of a giant Buddha statue in Leshan, China. Sculpture that reaches a height of up to 71 meters (233 ft.) Is not built with ease but it took a very long time and have a sketched of histories. 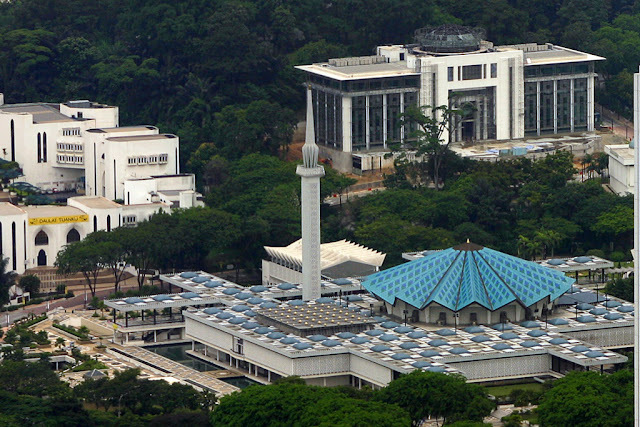 Indeed it is one of the most important places to visit and was listed as part of the "World Heritage Site" by UNESCO since 1996. 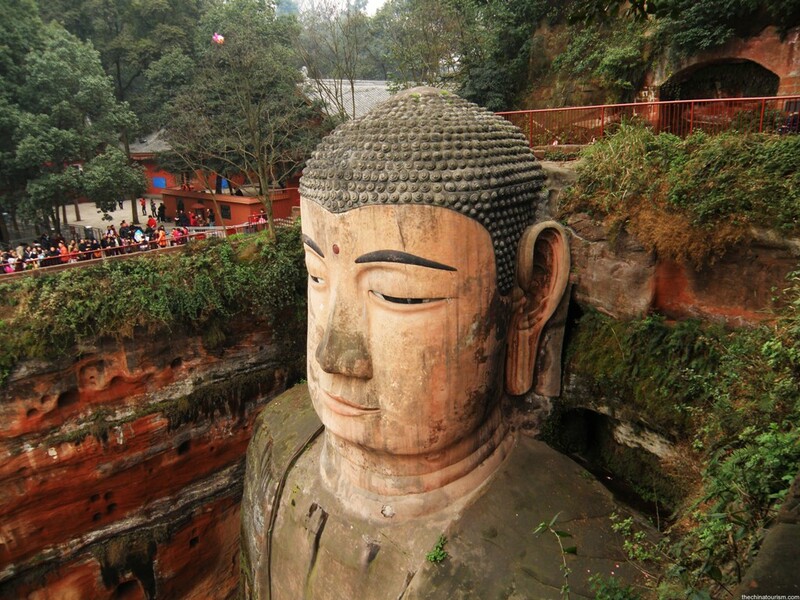 The history of its construction began in 713 led by a monk called Hai Tong, the construction of the Buddha statue that is expected to reduce the strong currents of the river flowing underneath. These jetted danger to ships using the route. His efforts, however, suffered a setback when the provision of the construction of the giant statue is not successful. Hai Tong said gouges his eyes as a sign of sacrifice to complete the statue. When he died, the construction work has been abandoned. Only 70 years later, his effort was refinanced again by jiedushi and construction projects were passed by the followers of Hai Tong in the year 803. Going down the stairs to the foot of the Giant Buddha. 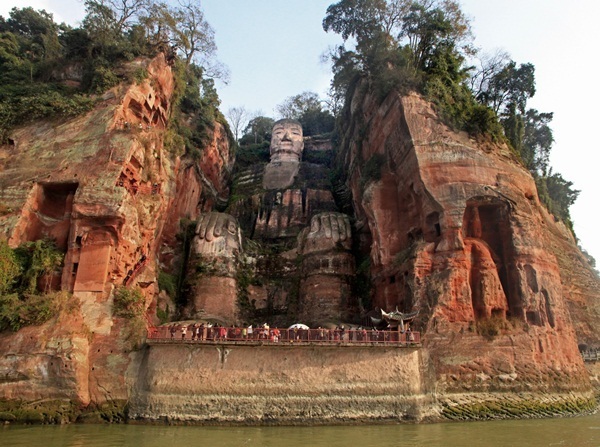 Construction of the statue caused huge amount of rock and dirt to be thrown into the river in front of the statue which is also a clash of 3 rivers of the Minjiang, Dadu and Qingyi makes it current calmer. This giant statue is actually equipped with unique irrigation / drainage systems to avoid the effects of erosion from flowing rain water. The system still works to this day. During the process of carving the statue, a 13-storey wood building built to protect it from rain and hot sun. 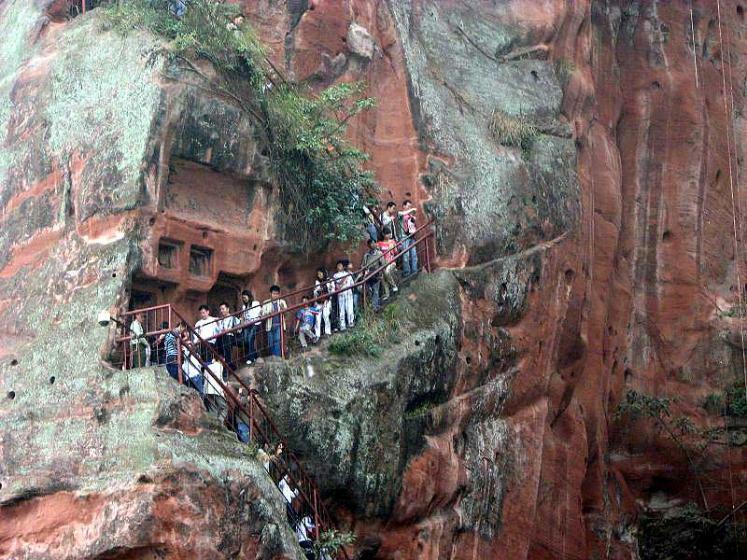 This construction, however, destroyed by the Mongols during the war at the end of the Yuan Dynasty. 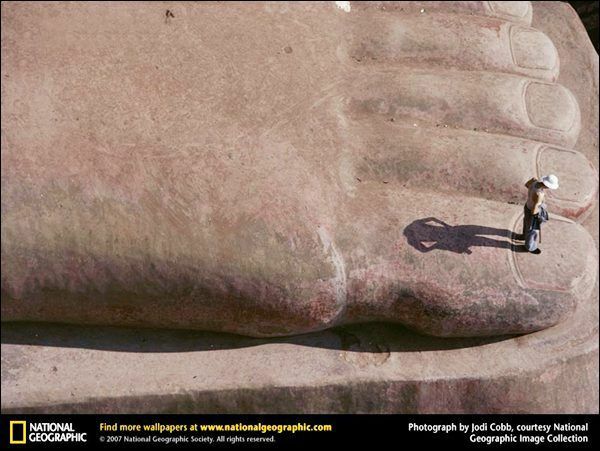 So starting from that the statue was exposed as seen today. Water flows in the river during the low season. 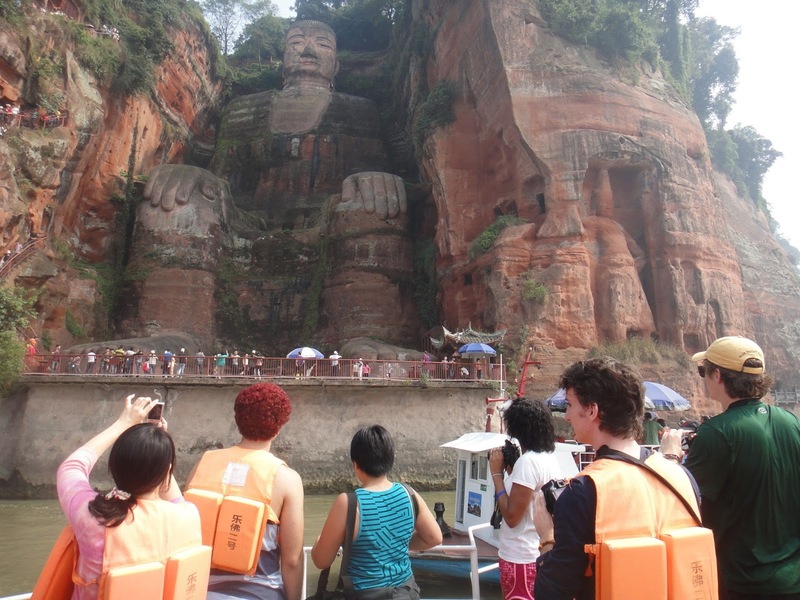 View of the Giant Buddha from the river cruise. Sure it is among some large constructions people interesting to watch. Although it may be a religious symbol for some people, but for others it became a symbol of determination, persistence, determination and confidence to do something. For those who like to visit here, the closest town to this location is Chengdu with a distance of less than 150 km.